There is an old Latin expression, "sine qua non," which translates as, "without which there is not." When it comes to health and nutrition, digestive enzymes may be the single most important "sine qua non." Anyone who has any understanding of health knows that unless you are on a totally raw food diet you should take enzyme supplements with every single meal. If you are not regularly using digestive enzyme supplements, then take a moment to get a better understanding of this simple, inexpensive step that can dramatically improve your health and vitality. In our previous report, Enzymes Defined, we explored the general nature of enzymes--what they are and what they do. In summary, enzymes are proteins that speed up chemical reactions. There are estimated to be 50-70 thousand different enzymes in your body that regulate every metabolic function needed to keep you alive. Without enzymes, all of these metabolic functions would progress through the same steps, but would go too slowly to sustain life. In essence, enzymes make life happen where otherwise there would be none. When it comes to digesting food, however, there are only a handful of enzymes that we need to worry about. Even so, choosing which ones to include in a supplement, and the ratios in which to include them, can be a daunting task for formulators…and for consumers when it comes to choosing which enzymes to buy. Before we get into the details of what constitutes the ideal digestive enzyme formula, let's take a look at why we need to use such a formula. Again, as we described in Enzymes Defined, nature intended that you eat enzyme rich food (all live foods have enzymes present in them that promote their own breakdown) and chew it properly so that it thoroughly mixes with your saliva (which is also enzyme rich). If you do that, the food enters your stomach laced with the necessary enzymes. These enzymes then "predigest" your food for about an hour -- actually breaking down as much as 75% of your meal. In healthy digestion, it is only after this period of "predigestion" that hydrochloric acid is introduced to the process (along with the enzyme pepsin, which is secreted in the stomach). This acid/pepsin mix inactivates (but does not destroy) most of the enzymes used in predigestion and then begins its own function of breaking down any undigested protein content left in the meal, turning it into an amino-acid-rich concentrate. Note: stomach acid and pepsin only work on the digestion of proteins. They are not involved in the breakdown of fats and carbohydrates. When this part of the process is finished, the concentrate moves on to the small intestine, where the acid is neutralized by the highly alkaline bicarbonate released from the pancreas, the inactivated enzymes are reactivated, and the pancreas introduces (along with the bicarbonate) whatever small amount of enzymes (proteases, lipase, and amylase) that are needed to finish the digestive process. As digestion is completed, nutrients are then passed through the intestinal wall and into the bloodstream. The bottom line is that before any of the food you eat reaches your body's cells, all the protein is broken down into amino acids, fats into fatty acids, and carbohydrates into glucose -- or at least they should be. That's what nature intended. Unfortunately, most of us don't live our lives as nature intended! Man is the only animal (other than a handful of domesticated animals) that eats cooked and processed food! Unfortunately, it's not only unnatural; it's also decidedly unhealthy. Why? Because any sustained heat of approximately 118--129 degrees destroys virtually all enzymes, thereby disrupting the entire digestive process. In addition, most forms of food processing also destroy enzymes. When we refer to processed foods, we're talking about anything made with white flour, white rice, pasteurized milk, processed cheese, chips, chemically preserved foods, soda pop, desserts, candy, TV dinners, etc. -- all are devoid of enzymes. The net result is that for most of us, the food we eat is severely enzyme deficient. Your body recognizes that the food you're eating is devoid of enzymes and tries to compensate. For one thing, it releases more stomach acid than normal to compensate. Also, over time, it trains itself to pack your saliva with more amylase. Amylase levels in the saliva of people who eat a modern diet and don't chew enough are as much as 40 times higher than in the saliva of people who eat a more natural diet -- but it's still not enough. The result is that instead of benefiting from predigestion as nature intended, the food you eat sits in your stomach for an hour, like a heavy lump, with little or no pre-digestion taking place. Assuming you're not eating a mostly raw, thoroughly chewed diet, regular supplementation with digestive enzymes minimizes the assault on your stomach, reduces the overproduction of hydrochloric acid, takes stress off the pancreas, maximizes the extraction of energy and nutrients, and prevents the draining of the body's energy reserves -- all by providing the enzymes required for digestion as nature intended. In other words, a well-designed digestive enzyme supplement just may be one of the best insurance policies you can give your body to enjoy a long and healthy life. Over the years, I have heard numerous arguments from medical doctors, mainstream nutritionists, and even some natural health practitioners as to why digestive enzyme supplements are either useless…or even harmful. In truth, these arguments are based on false assumptions and quickly dismissed. Let's address the four main counterarguments. As we've already discussed, in healthy digestion, stomach acid doesn't enter the stomach until about an hour after eating. But really, let's think for a moment. Do these same experts believe that your body would pack your saliva with amylase if it was going to be neutralized the moment you swallowed your food? Does anyone who has studied the body believe it knowingly wastes resources in this manner? Also, as we explored in detail in Enzymes Defined, for the most part, enzymes are not destroyed by stomach acid--merely inactivated until the pH of their environment is once again made more alkaline by the introduction of bicarbonate in the duodenum. And finally, some enzymes actually thrive in the high acid environment of the stomach--pepsin and acid stable protease, for example. And in supplements, you can use acid stable protease. The name says it all. Yes, this might be true if the enzymes were active while in the food in their normal state, but they are not. In truth, enzymes in food and seeds are dormant, waiting for the right time (determined by moisture, temperature, and exposure to day/night cycles) to activate. For example, the enzymes in seeds and nuts require the presence of moisture to activate. You can keep a seed or nut in your pantry for months or even years and nothing will happen. But soak those same seeds and nuts in water for 24-48 hours and sprouting takes place. During sprouting, the endosperm (the part we like to eat) uses enzymes to self-digest itself to feed the now growing embryo. How long can seeds wait before self-digesting? The oldest seeds on record to finally germinate and grow were date palm seeds found at the ancient Jewish fortress of Masada. They had been there for 2000 years before finally being discovered and subsequently germinated.2 It also should be noted that many regulatory enzymes found in plants are strong proteases such as bromelain and papain. And although their role in plants is regulatory, not digestive, in the presence of protein based foods, they play a major role in breaking those foods down. Papain, for example, is used as a meat tenderizer. And it's not just plants. Meat too has enzymes in it that can cause it to self-digest and break down. This is why "aging" beef tenderizes it.3 You don't have to add anything to the meat. The natural enzymes already present in the meat activate during the aging process and commence the breakdown of the connective tissue in the muscle, which leads to more tender beef. These same enzymes don't break down living tissue because, in living tissue, natural enzyme inhibitors hold them in check. The fact that enzymes are present in raw food is not nonsense; the argument that they aren't, however, is. Make no mistake, taking supplemental enzymes with every meal not only improves the digestion of that particular meal, it also extends your body's ability to produce both the necessary enzymes and stomach acid as you age. And then there are those who argue that the pancreas is like a muscle and needs to be exercised by constantly being forced to make enzymes or it loses the ability over time. We've already covered this, but to extend the "muscle building" analogy: any good bodybuilder knows that you have to rest a muscle after exercising it if you want it to build up. If you don't rest the muscle, it actually breaks down and gets weaker over time. The same holds true for your pancreas' ability to produce enzymes and your stomach's ability to produce acid. If you are always pushing it to the limit with every meal, your body's capacity to produce both will degrade sooner rather than later. Now let's take a look at what an ideal dietary enzyme supplement looks like. Many people think that designing a digestive enzyme formula is as simple as racking up big numbers in the key enzymes such as protease, amylase, and lipase. Some companies go so far as to present tables in their literature comparing their protease levels in their formula to the levels found in competitors' formulas, with the implied understanding that he who has the most wins. If only it were that simple. The fact is that a good digestive enzyme needs to work with real world diets. The simple truth is that too many formulas on the market put in far more protease than is required for a typical diet (simply to show a big number on the label) -- and far too little amylase or lactase--not to mention almost none of the specialized carbohydrate enzymes. (Remember, you can only fit so much in a capsule. If you add more of one ingredient, you have to use less of something else.) In the end, it's not about the numbers, it's about the ability of the supplement to work with real world diets. Keep in mind, I'm not talking about providing an excuse for eating badly, even though a good digestive enzyme formula will certainly help those who do eat badly. What I'm talking about is a formula that helps people who try and do the right thing but still need help because they live in the real world. They still have to eat on the road more often than they might like. They still eat more cooked and prepared foods than is ideal. In other words, they eat "real world" diets. "These Digestive Enzymes really help. Before, I used to get indigestion all the time, but now I have no problems at all. I can't get along without [them]." James T., FL. All too often, nutritional formulas are designed by people who get their "expertise" from books, not real world experience. This makes for formulas that may look good on paper, but make no sense in the real world. Examples include formulas that contain 30 ingredients stuffed into a 500 mg capsule. On paper, it gives companies bragging rights to all of these great ingredients in their formula, which some people think is a good thing. But the reality is that if all the ingredients are equal in the formula, that means just 16.7 thousandths of a gram of each ingredient is present. In fact, the reality is usually worse, with the first few ingredients getting more and the rest getting as little as 4, or even 2, thousandths of a gram. Incidentally, a full gram is only 1/28 of an ounce. When you get down to 16.7 thousandths of a gram or less, you're talking pixie dust levels for a given ingredient. In fact, the ink identifying the ingredient on the label may weigh more than the ingredient in the capsule itself. So what does this have to do with enzymes? Well, it's hard enough to stuff all of the enzyme activity you need into a 500 mg capsule, even packing capsules full to the brim with the highest quality enzymes. And yet, so many enzyme formulas, stuff their enzyme capsules with more herbs than enzymes because it looks good on the label. For example, I went on the net and randomly pulled up a major selling enzyme formula. It has only a little over 100 mg of enzymes in each capsule. That's just one-fifth of the capsule by weight. What it does have is over 300 mg of herbs (nothing wrong with them except for the fact they have nothing to do with the purpose of the formula) and 100 mg of fillers. That means that with this formula, it will take you 5 capsules to get the enzyme activity you would get from just one properly designed capsule. Incidentally, this is the same formula that the Whole Foods nutrition expert recommended to me when I recently went browsing in one of their stores. When I asked them why they thought this was the best digestive enzyme formula, they answered, "Well, it has more stuff in it than any of the other formulas we carry." The important point is that when buying a digestive enzyme formula, you need to look at activity levels, not mg's. Now let's talk about protease. Is it important? Absolutely! But even when limiting our discussion to just protease, things are a bit more subtle than how large our numbers are. It's not just a question of "how much" protease you have, but also "how effective" that protease is in the different pH environments the formula will encounter as it moves through the digestive tract. Remember, the stomach starts out as pH neutral then shifts to highly acidic an hour after eating, and then as the food leaves your stomach and enters the intestinal tract, it encounters an alkaline environment. The problem is that proteins need to be broken down in all three environments, but no single protease works optimally in all these environments. There is only one answer. You have to use more than one source of protease, and one of them has to be acid stable. This is a fairly simple concept, but it is amazing how many companies ignore it in their formulas. Make sure you don't when purchasing your formula. Let's now elaborate on two important reasons that we've already alluded to for making sure that your enzyme supplement begins working in the stomach. They are concerned with signaling. The amount of enzyme predigestion that takes place in your stomach is a key factor (along with the volume of food in your meal and the current pH level in your stomach) to two crucial signals sent to your body. First, the less predigestion that takes place, the more stomach acid your body will produce to compensate for the lack of predigestion. The more predigestion that takes place, the lower the requirement for stomach acid. This has profound implications for both acid reflux disease and for the ability of your body to produce sufficient stomach acid as you age. Overproduce in the short term and you'll burn out your ability to produce in the long term. Second, the less predigestion that takes place in the early stages of digestion, and the more stomach acid released in your stomach as a result, the greater the amount of bicarbonate and pancreatic enzymes that your pancreas will be forced to produce to compensate. The net result is that the greater the workload on your pancreas in the near term, the less it will be able to produce as you age. Some formulators actually enteric coat their enzyme tablets, ostensibly to protect them from stomach acid. But this is counterproductive -- the result of book learned theory, not real world experience. If the enzymes are enteric coated, they won't begin working until they reach the intestinal tract. Yes, an argument can be made that this makes sense for some systemic, proteolytic enzyme formulas--especially if they contain serrapeptase--but not digestive enzymes. The primary role of digestive enzymes is to work in predigestion. If they are enteric coated, that can't happen. While it's true that they will help digest the food once it reaches your intestinal tract, without working in the stomach, they will have no influence on the signaling mechanisms that slow down the release of excess stomach acid or the overproduction of bicarbonate and enzymes by the pancreas. As we discussed earlier, that's a crucial benefit you're looking for from your digestive enzyme supplements. Enteric coated enzyme tablets, by definition, do not provide it. Lipase is actually the simplest of the enzymes to deal with. It's fairly acid stable, and it works on pretty much all fats -- aided later in the digestive process by bile produced in the liver. As long as you have enough lipase in your formula, you're pretty well covered, although some people may need to add bile salts to their supplementation program if their livers are not producing adequately, or their gallbladders are blocked. Bile salts are usually sold in the form of ox bile supplements. This is where we separate the men from the boys when it comes to digestive enzyme formulas. This is where a formula designed for "real world diets" moves ahead of formulas designed from textbooks. The simple truth is that there is no one "carbohydrate enzyme" that breaks down all carbs. Thinking that just including lots of amylase in your formula will break down all the carbohydrates and starches in your diet is going to leave you disappointed. Lactase to digest milk sugar. Lactase deficiency is the most common and well-known form of carbohydrate intolerance. Most mammals, including humans, have high intestinal lactase activity at birth. But, in most people, this activity declines to low levels during childhood and remains low in adulthood. The low lactase levels cause incomplete digestion of milk and other foods containing lactose. Symptoms include mildly increased levels of gas and bloating. It is estimated that approximately 70% of the world's population falls in this category and is somewhat deficient in intestinal lactase. Most people in this category simply ignore the symptoms thinking they're just a normal part of life. On the other hand, it is also estimated that as many as one-third of the U.S. population are presumed to be so deficient that they qualify as lactose intolerant and are simply unable to digest dairy products without major problems.5 (In Japan, that number is estimated to be anywhere from fifty to ninety-percent.) For these people, the symptoms are so severe, they cannot be ignored. Supplemental lactase enzymes have been found to decrease the symptoms of lactose intolerance associated with the consumption of dairy foods. Note: even if you don't eat dairy products at home, they are added to many foods that you will eat in restaurants. Amylase helps your body break down and assimilate starches and carbohydrates. Carbohydrates that we eat mainly come in the form complex sugars and starches. Amylases hydrolyze (break apart) these long chain carbohydrates at the interior alpha-1, 4-glucosidic bonds, separating them into disaccharides and trisaccharides which, are then converted by other enzymes to glucose to supply the body with energy.6Supplemental amylase is particularly useful for those who don't chew enough. How much should you chew? The standard recommendation in the natural health community is that you need to chew each mouthful of food between 25 and 50 times. (The number will vary with each person.) And when it comes to juices and smoothies, the number remains the same, but instead of chewing, we're talking about swishing the liquid around in your mouth 25-50 times so that it gets thoroughly mixed with saliva. If you're not chewing that much, then you need a digestive enzyme supplement with amylase. Glucoamylase assures the breakdown of maltose (malt sugar) into glucose molecules. The action of glucoamylase completes what amylase starts; it ends in the release of glucose. Glucoamylase works hand-in-hand with amylase by breaking down terminal linkages, whereas amylase breaks interior bonds. Specifically, glucoamylase hydrolyzes terminal 1,4-linked alpha-D-glucose residues successively from non-reducing ends of amylose chains left behind by the action of amylase to release free glucose.7 A digestive enzyme formula with amylase but without glucoamylase is like Laurel without Hardy. It simply doesn't do the job. Hemicellulase completes the job that cellulase starts by breaking the interior glucosidic bonds of galactomannoglucans yielding polysaccharides of lower molecular weight. Hemicellulase breaks down hemicellulose. Bottom line: hemicellulase helps break down fiber components in the intestinal tract--again releasing the carotenoids, polyphenols and other phytochemicals bound to the fiber..
Invertase works to break down sucrose products like refined table sugar. The abundance of processed and highly refined foods in the average diet means we consume a great amount of this type of sugar which can contribute to digestive stress. It has been theorized that sucrose intolerance may be a contributing factor in many allergies.10 Supplemental invertase enzymes can increase the assimilation and utilization of this sugar, while at the same time minimizing any possible allergic responses. Alpha Galactosidase helps minimize gas, bloating, and flatulence caused by carbohydrates found in certain foods such as beans that are not readily digestible in the small intestine. Undigested, these carbohydrates then pass into the large intestine where they are fermented by bacteria and produce gas, bloating, pain, and general discomfort. The use of supplemental alpha galactosidase minimizes this problem. Supplemental pectinase actually helps with the digestion of proteins. Research indicates that the pectin found in fruits may coat proteins eaten in the same meal, thereby inhibiting their complete digestion. Pectinase breaks down the pectin coating the proteins, thus allowing for the complete digestion of proteins – and thus reducing the possibility of food allergies. Some enzyme formulas like to include HCL (stomach acid) in the form of betaine hydrochloride to aid in digestion. But for the reasons that we've already talked about, this does not make sense. Taking betaine HCL along with your enzyme supplement (or as part of it) creates an acid environment too soon in the digestive process. The bottom line is that for those who need supplemental HCL (a significant percentage of the elderly as we've already discussed), it should be taken as a separate supplement 40-60 minutes after you finish eating. Protease -- 40,000 HUT (Hemoglobin Units, Tyrosine basis). Acid Stable Protease -- 1,500 SAPU (Spectrophotometric Acid Protease Units). Lipase -- 1,400 FIP. Formerly measured in LU (Lipase Units), but now more commonly measured in FIP units (i.e., according to the test methods of the Fédération Internationale Pharmaceutique). On a unit to unit basis, 1 FIP is equivalent to 10 LU. Amylase -- 16,000 SKB (named after the creators of the test: Sandstedt, Kneen, and Blish ) or DU (used in the brewing industry). SKB and DU match up one to one. Invertase -- 200 SU (Summer Units). Sometimes labeled IAU (Invertase Activity Units). 1 IU is equivalent to 500 SU. It is these kinds of ingredients at these kinds of levels that actually work on the complete range of foods you are likely to eat -- whether it's a gulped down sprout salad at home, or a pepperoni pizza on the road. It is these enzymes that define a formula as designed for "real world" diets. As Dr. Howell said in his book on enzyme nutrition, "A person's life span is directly related to the exhaustion of their enzyme potential. And the use of food enzymes decreases that rate of exhaustion, and thus, results in a longer, healthier, and more vital life. "12 But what does this mean in real life? Improved digestion of dairy products caused by lactose intolerance. An increase in energy levels as the result of greatly reduced stress on the body. Incomplete digestion. Too much stomach acid is certainly a problem, but so is too little. Stomach acid is essential to unwind proteins so pepsin can work on breaking them apart. Without sufficient stomach acid, proteins are only partially digested, which means that many insufficiently broken down proteins enter the bloodstream causing allergic and autoimmune problems. Enzymes present for predigestion can help mitigate some of the problem by breaking down some of the proteins without the need for normal levels of stomach acid. But that said, the problem of incomplete protein digestion is only compounded when you use acid reflux medication since you end up with insufficient stomach acid…or virtually none in many cases. Accelerated pancreatic burnout. The less protein that is broken down in the stomach as a result of insufficient stomach acid, the more pancreatic enzymes your pancreas must produce to make up the difference. If your diet is also enzyme deficient, this doubles the stress on your pancreas. And finally, regular use of enzymes to aid digestion may provide relief from ulcers in two ways. A cautionary note. There is one concern when using digestive enzymes with ulcers -- and that's if you have a severe existing ulcer. What happens is that the protease can actually begin to digest severely damaged stomach tissue since it's no longer protected by the mucosal lining. This can cause noticeable discomfort for several days. To avoid this discomfort, if you have a severe ulcer, start with very small amounts of the digestive enzyme supplement with your meals and build up slowly. The good news for the average person in the real world is that supplementing with a good digestive enzyme formula goes a long way to improving how your body works and feels. We should now understand what Dr. Howell meant when he said that a person's life span is directly related to the exhaustion of their enzyme potential, and that the use of food enzymes decreases that rate of exhaustion, and thus, results in a longer, healthier, and more vital life. At a minimum, you should now understand why it's important to use a good digestive enzyme supplement with each and every meal you eat -- particularly any meal that contains either processed or cooked food. How many enzymes should you take? Well, that depends on the strength of your formula and the size of your meal. If one capsule works for most of your meals, you may find you need to take two when you overindulge, or even four with your Thanksgiving feast. And when do you take your enzymes? The simple answer is to take them just before you start eating so that they start releasing even as the first mouthfuls of food are entering your stomach. This sends a signal to your body that enzymes are present and begins to train your body to hold back on the stomach acid for the 40-60 minutes as nature intended and to cut back on the amount of pancreatin it needs to produce. If you forget to take your enzymes before you start eating, they can still be of some use after you eat -- depending on the size of the meal and how heavy it is and if your formula contains acid stable protease. In fact, you may find that you can still get a notable benefit, although no signaling benefit, taking an enzyme supplement 3-4 hours after eating a large, heavy meal -- you know, the kind that feels like it sits in the stomach like a giant piece of lead for hours! And finally, keep liquids with your meals to a minimum. Liquids with your meals dilute all aspects of digestion-- enzymes in your saliva, enzymes in digestion, stomach acid, and pepsin released in the stomach. And it exhausts your body, forcing it to compensate by packing more amylase in your saliva, releasing ever greater amounts of stomach acid and pepsin, and stressing your pancreas to release larger and larger amounts of pancreatin to pick up the slack. Other than a few sips of liquid while eating, drink your liquids between meals, not during. It is possible to use digestive enzymes as systemic, proteolytic enzymes (enzymes designed to clean out the bloodstream and body and which are taken without food so they go into the bloodstream). In fact, for years I designed enzyme formulas in this way--to provide dual function. It's convenient, and it does work. The problem is that you have to compromise your formula to do this. A capsule can only hold so much. If you beef up the protease to accommodate the proteolytic functions, you have to back off from the other digestive enzymes. But if you make the formula a full spectrum digestive enzyme formula, you have to cut back on the proteases and anti-inflammatory supporting ingredients, or at least the ability of the proteases to work in a wide range of pH's. 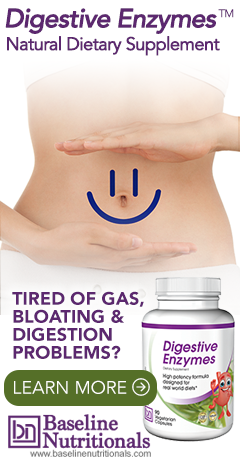 The bottom line answer is that yes you can use a good digestive formula for both purposes. This is certainly an option if you are allergic to ingredients like bromelain or papain. But barring that situation, you're better off using digestive enzymes supplement with your meals and a pure proteolytic formula between meals. Make a bowl of instant oatmeal. Mix a couple of digestive enzyme capsules into just one of the bowls of oatmeal. Keep mixing. Note: this mimics the action of the stomach which is continually squeezing, mixing, churning, and grinding the food that you eat. In 30-60 seconds, if the formula you are using is any good, there should be a pronounced difference in the oatmeal. Whereas it was previously congealed, lumpy, and had a stick to your ribs consistency. It will, now that the enzymes have begun to work, look quite different. It will have the consistency of watery gruel. Which version of the oatmeal would you rather have work its way through your body: the one that's stuck to the bowl like cement, or the watery gruel that's undergone predigestion? Which oatmeal do you think is less stressful to digest? This is a fun demonstration, and video versions of it are posted all over the internet. Most of the people who talk about it on these demos have no idea what's actually going on and misrepresent the facts. They claim that it is proof that their enzymes are better than anyone else's and that it shows how quickly enzymes can digest your meal. It actually shows neither of those things. Virtually any reasonable digestive enzyme formula, and even some that are not that reasonable to tell the truth, will do the trick. All it takes is having some amylase in your formula, which most do. Technically, what's happening is that oatmeal consists of some 90% (1,3/1,4) beta glucan, a soluble fiber. When the oats encounter hot water, these beta-glucans begin to absorb water and swell. They form a loose three-dimensional network, trapping water into a soft gel, thus giving the oatmeal its congealed appearance. As we discussed earlier, amylase breaks carbohydrates at their interior 1,4 bond. And that's what happens when you add enzymes to oatmeal: they break up the three-dimensional network that holds your oatmeal together--returning it to a watery consistency. The test does not show that the enzyme you are using can break down protein (that takes longer), or even other complex carbohydrates for that matter. But most importantly, it doesn't show whether or not the enzymes can then break down the disaccharides and trisaccharides produced by the amylase into glucose, which is what your body can actually use. You need glucoamylase in your formula to do that. Does that make the test meaningless? Not at all. It actually demonstrates several important things. Enzymes really do something. They are not a placebo. They work quickly. In seconds, they break down the simple carbs. Give them a full 40-60 minutes as they would have in the stomach, and 70% of that oatmeal truly would be digested. And finally, the visual difference in the two versions of the oatmeal truly does give you a sense of how much less stressful it is to your body to digest a meal that has been eaten along with digestive enzymes versus one that has not. Incidentally, this experiment directly relates to a comment below where someone asked: if amylase speeds up the digestion of carbohydrates, does that mean it also speeds up the rate at which sugar enters the blood—thus putting you at greater risk of diabetes? That turns out to be a good point, but the wrong question. The right question is: do higher levels of amylase increase the glycemic response, thus making your body’s response to starches more unhealthy? And the answer is: no, they do the exact opposite. Studies show that higher levels of amylase activity are actually associated with improved glycemic homeostasis following starch ingestion in adults.14 So be assured that taking supplemental enzymes with amylase is beneficial and actually lowers your diabetes risk. A new digestive enzyme has recently been made commercially available. It's called dipeptidyl peptidase, or DPP-IV for short. Theoretically, it has the ability to modestly assist in breaking down three problematic proteins: casein, gluten, and gliadin.15 What's not to love? I have been researching it for some time and have confronted four problems. Without human studies, no one really knows how much is needed--again assuming it works at all. It's pretty much guess work at the moment. DPP-IV activity comes as part of an overall peptidase enzyme, and it's not very concentrated. You need to use a lot of the generic peptidase enzyme to get an adequate amount of DPP-IV activity. This means it's difficult to use as ingredient in an overall digestive enzyme supplement. You almost have to use it as the primary component in a gluten specific formula. And finally, to make matters even worse, there is no agreed upon standard for determining activity levels for the enzyme, which makes resolving the first two issues that much more difficult. None of these problems is insurmountable. In fact, these kinds of issues are quite common with new ingredients. Some companies have even started including it in gluten specific formulas even though questions about its efficacy remain unanswered. I'm not willing to do that. I will continue researching DPP-IV, and if I conclude that its addition can actually improve the formula we outlined above, I will not hesitate to add it--or possibly use it as the central enzyme in a gluten specific formula. And then, as with my digestive enzyme formula, which is what we’re talking about today, we have a third option. If the new ingredient you’re adding doesn’t take up too much room, you might be able to find a stronger version of the ingredients you’re reducing in the formula so that you end up with exactly the same efficacy for those ingredients, even though you’re slightly reducing the amount you’re using. To make room for the AstraZyme™ I added, I slightly reduced the milligrams of two of the enzymes in the formula. But you will notice there is no difference in the activity units listed on the label. And that’s because I was able to find more concentrated versions of those two enzymes that produced the exact same activity level at slightly lower milligrams. This is a nice trick if you can pull it off. For all the above reasons, I have added AstraZyme™/AstraGin™ to my Digestive Enzyme formula.